Mouse Siglec-15, His Tag (SG5-M52H7) is expressed from human 293 cells (HEK293). It contains AA Arg 24 - Thr 262 (Accession # A7E1W8-1). The protein has a calculated MW of 27.5 kDa. 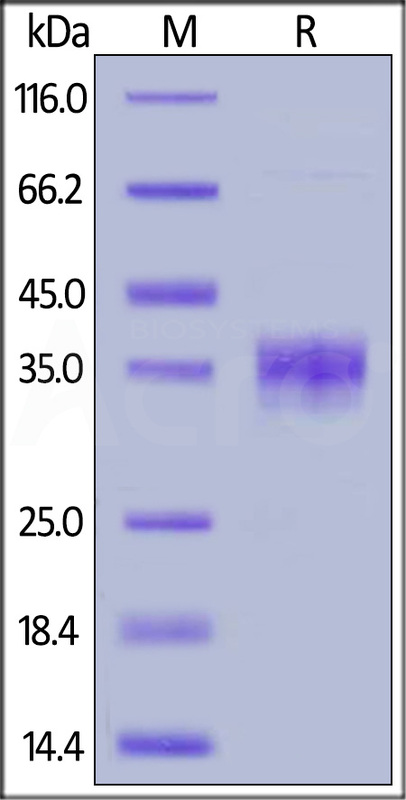 The protein migrates as 33-40 kDa under reducing (R) condition (SDS-PAGE) due to glycosylation. Mouse Siglec-15, His Tag on SDS-PAGE under reducing (R) condition. The gel was stained overnight with Coomassie Blue. The purity of the protein is greater than 90%. Siglec-15 is a DAP12-associated immunoreceptor, which belongs to the immunoglobulin superfamily and SIGLEC (sialic acid binding Ig-like lectin) family. Siglecs are cell surface proteins that bind sialic acid. They are found primarily on the surface of immune cells and are a subset of the I-type lectins. Siglec-15 consisting of immunoglobulin (Ig)-like domains, transmembrane domain and a short cytoplasmic tail. Siglec-15 is that recognizes sialylated glycans and regulates osteoclast differentiation. Siglec-15 is a potential therapeutic target for osteoporosis and plays a conserved regulatory role in the immune system of vertebrates. (1) Angata T, et al. 2007. Glycobiology. 178(8):838-846. (2) Yusuke K, et al. 2015. Bone. 17:217-226. (3) Hiruma Y. et al. 2011. Biochem Biophys Res Commun. 409(3):424-9.